........ doesn't AB last a lot longer? How can anyone possibly know this? A lot of accelerated testing has been done with very good results. Since the surface is not effected by water chemistry in any way, what is there to wear out and fail? There are many pools out there that are over 10 years old that have no issues. Thank you for the reply! Im always open to learning but Im confused. How can a 7-8 year old company (ecofinish, the offshoot of Carlton pools....was formed in 2009 I believe) have "many" pools that are over 10 years old with no issues? Accelerated testing is important but there is absolutely no substitute for the real thing. There are hundreds if not thousands of examples of companies that performed "accelerated testing" only to find out that they were off base and that time itself along with actual exposure to real world environments cannot be replaced. Accelerated tests are important - but real research, testing and exposure has no replacement for time. My point is simple - no one actually knows about the real life longevity of the product...because the product itself, in pool use, is still pretty new and not widespread. It may or may not have a longer lifecycle but it is still unknown. I believe that the first AB pools were installed in 2007. A handful....and from Xiom prior to Carltons deal....and right before XIOM went through a reverse merger transaction....IN dec of the same year. Also, agreed that the best way to know if a product will last 20 years is to wait 20 years. If AB pools exist that are 10 years old and their surfaces are still in good condition, then that places them in the sane league as plaster pools. Because while we say that plaster pools last 30 years, that's simply not reality. The truth is, a plaster surface, on average, will probably last about 10 years before it starts to look shabby. My pool is a little over 4 years old and needed a plaster patch for a crack and delamination. The patch looks terrible because the rest of the plaster color is faded which occurred in about year 3. Plaster fading happens IN EVERY PLASTER POOL. So, if AB can maintain its color and uniformity 10 years out, then it has exceeded what a plaster pool can achieve. That, plus the chemical stability, makes AB a better performing surface. Lets compare apples to apples then. If a plaster pool has problems short of 10 years...or in your case 4 years - then there was likely something wrong - somewhere. To categorically compare them to AB and act as if no AB pool every had application problems or issues short of 4 years...is simply ignoring facts. All pools will have issues if the application of the finish product was not done correct and/or if there was something inherently wrong with that specific batch. And for the record and to keep fact straight- there are VERY, VERY few 10 year old AB pools...just like there are plenty of plaster pools greater than 10 years old with zero problems....but thats not apples to apples either. I do not believe that it is an accurate statement that all plaster pools will look bad in 10 years. I may be wrong, but I havent seen anything factual to back up the statement. Plue, if TFP water management is applied, clearly a plaster pool will look beautiful in 10 years - right? I'm not ignoring the statistics and I don't disagree with your points. But let's not pretend like plaster pools are somehow defect free. Too many people cite 20 years as the standard for plaster and it's simply not true. Applicators nowadays are a dime-a-dozen and they cut corners like crazy. They bang out three to four pools a day and few if any take the time to do the startup correctly or even follow the most basic technical guidelines from the NPC. I'm totally willing to take a wait and see approach to AB for more data points to come in but, from the initial results, it's so far performing just as well as plaster and, in the area of water chemistry, AB blows away plaster. If you look at recent threads here and the history in our build sub-forum, you see lots and lots of plaster defect threads with people only a year or two out and already experiencing problems. Just this morning there was a thread with someone who had a one year old plaster job and had to have the pool drained and sanded to fix mottling. I believe plaster problems are far more widespread and the problems are just hidden due to lack of reporting and independent data analysis. I would not be surprised if independent analysis showed plaster lifetimes far far lower than what the industry reports. Again, my beef is with the notion that plaster lasts 20+ years...I just simply don't believe it and I think it's a false metric used to make plaster "look" more competitive than it actually is. And no, following TFP levels DOES NOT guarantee a long lasting finish. Most problems with plaster are the fault of the applicator NOT water chemistry. The only area where water chemistry plays a role is color-fastness and, with the use of chlorine, no plaster pool will last more than a few years before bleaching occurs...except for white plaster. Would you agree that the ratio of Aquabrite to Plaster (including marcite,pebble, quartz, etc) is probably about 500 to 1? Wouldnt you expect to see and hear more about those issues just based on the volume? For the record I am guessing at the 500 to 1 and used no actual evidence whatsoever so I may be way off in either direction! AB has issues also. They have had their own application issues and product failures. All pool finished have issues. I dont think that I said that following TFP water management would "guarantee" a long lasting finish, but if I did, I apologize. ..as that is not what I meant to say. I do believe that if the application was good and TFP is followed, it will significantly increase the likelihood of a long lasting finish. Whatever the ratio of numbers is, it doesn't matter. The statistics are better done within a specific plasterer as opposed to in the aggregate because there's no way to easily control for variations in workmanship, especially when large plasterers have multiple crews working in the same area. It would be best to simply look at applicators that do both AB and plaster pools and compare the differences there as you then remove the variations caused by workmanship. In those specific cases I would not be surprised at all if the AB customers were much happier with the end result than the plaster customers. At the end of the day, the plaster industry is very hard to figure out because the problems are mostly workmanship related and there's not much reliable, independent data to look at. I've plastered many pools and had issues. Now that I also install AquaBright I've found that a plaster job that I'm happy with would never pass for an AquaBright pool. I'm sick of seeing horrible looking plaster pools. There are several homeowners in my area that have inquired on AquaBright with pools less than 2 years old. Smanni, you seem opposed to AquaBright and are located in PA. Do you have first hand experience? I ask because the only issues I've heard of with AquaBright all involve the installation. I've yet to hear of a failure after the installation. Have you? I sent my reply to you as a PM instead of posting them publicly. There are plenty of plaster pools needing replastering in 3-5 years due to scaling and etching. Which is always caused by water chemistry. I do believe that plaster can last 20 years with TFP managed water. OnBalance also says that. As for fading, yes it will happen. My black plaster started fading in year 2 or 3 and is more than half faded starting season 6. It is more faded on horizontal surfaces than vertical surfaces. So I assume that it is faded more from UV. Most complaints about plaster are cosmetic, not functional. Blotchiness, mottling, streaking and other common complaints have little impact to plaster longevity. Yes, i would also guess that plaster vs Aquabright pools is hundreds to 1 so you would expect significantly more reports of plaster issues. But, I am not aware of a single complaint about aquabright in a thread in TFP. 100% agree that water chemistry is much easier and much less important in Aquabright than in plaster pools. Colorfastness and color uniformity also appears to be clearly superior. It's why I had my pool replastered with white plaster last year. That and with a diving well I want to make sure the bottom of the pool is easy to see. might be boring but so be it. I recently resurfaced a plaster pool finish that was 17 years old (and which replaced the original 20+ year surface). 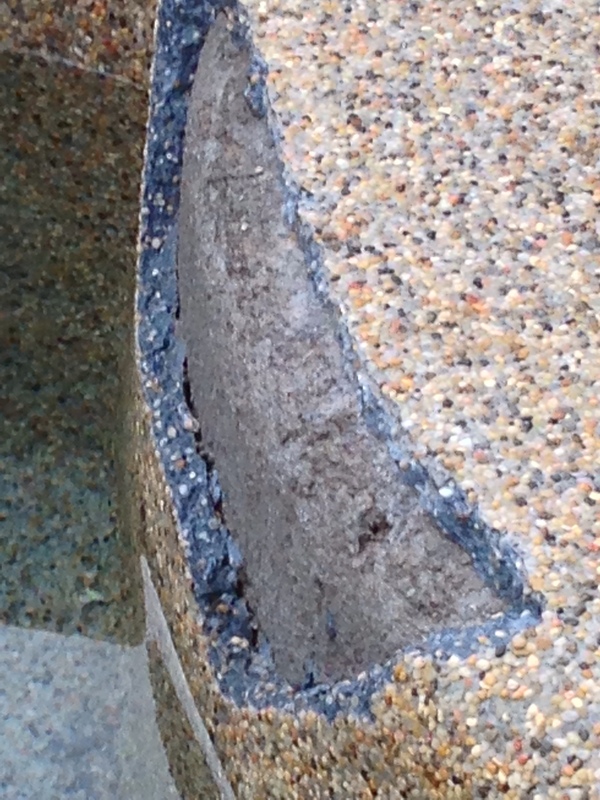 There is no reason a plaster finish cannot last 20 years, assuming the pool is maintained well. If your plaster surface was delaminating and cracking after 4 years then that is not at all normal, either the plaster was not properly applied or the chemistry was off. Notice how the plaster cream at the surface is grey (about a few mm thick) and the rest of the bulk of the plaster is its original blue. My pool has NEVER been chemically imbalanced and was on TFP recommended levels from day 1. My pool was "slammed" once (about two days at 20ppm FC with a CYA near 70ppm so not even an aggressive SLAM). The plaster job was done by one of the largest plasterers in my area (runs multiple crews, in business for over 30 years) and they are licensed PebbleTec installers. What you see above can happen to ANY pool and the fading WILL HAPPEN to every colored plaster pool no matter what your chemical levels are. It's a consequence of using chlorine and the only surface immune to bleaching is a white plaster surface. Delaminations are not caused by water chemistry and the guy you directed that comment to is smarter than I'll ever be in 10 lifetimes. I have done several studies and forensics analysis on all forms of pool plasters and have found that the vast majority of issues are a direct result of applicator errors and omissions. Kim Skinner with OnBalance is considered one of the industry leaders on plaster formulations, failures and water balance and he would likely say the same thing. No one is saying plaster can not last a long time, but what did yours look and feel like after 17 years? I'm sure there was a reason you had it resurfaced and I'm positive it wasn't because you felt like shelling out some extra cash that was laying around. Plaster doesn't just decide to fail one day. It deteriorates, discolors, becomes rough, brittle and delaminates with time. Long term water chemistry has a huge role to play with this which doesn't help since most pool owner's idea of caring for their pool is through neglect. I found AquaBright in a search for something better than cementitious surfaces. Whether it is or isn't has yet to be determined but I've been pleased with the outcome and so have my customers (unless they are trying not to hurt my feelings). It isn't for everyone and it shouldn't be, but it is a viable option for a person that sees it as a good fit for their lifestyle and needs. First of all, I said "not properly applied or the chemistry was off" and I should have said not properly cured. As for the reason I had to replaster when I did it was because the pool service I hired to close my pool drained it completely before putting on the cover. In Chicago. The surface was completely destroyed over the winter. IF it had not been the I could easily have gone another few years. I'm not here to suggest your AquaBright isn't a good product, but I also won't agree that a plaster surface will look shabby in 10 years, regardless of how many multiples of intelligence the person making the statement has over me. My surface looked pretty good at 17 years. I did look at AquaBright at my replaster, but my surface needed to be completely redone due to massive delamination, so the cost of getting to a smooth surface PLUS the cost of AquaBright made zero sense financially (probably made less to someone smarter than me).